If you’ve been to the dentist, then you’ve probably dreaded hearing those four words – “you have a cavity.” A cavity is a hole in a tooth that’s caused by decay and bacteria, and dental fillings are necessary to repair these holes and restore the tooth to its proper shape and function. A tooth with a cavity can cause oral pain, especially when you chew or eat something hot or cold. At Great American Smiles in Austin, we can provide tooth fillings to restore your smile to its bright, beautiful state. Fillings are necessary to restore a tooth, but they’re also important for preventing further decay that could impact other teeth. Stopping decay as soon as possible is imperative for proper oral health, and that’s why regular dental check-ups are key for every person. If left untreated, decay can cause serious damage to your teeth, and could lead to multiple extractions and the need for dental implants or dentures. There are those who have never had a cavity, but chances are you’ve had one or two in your lifetime. 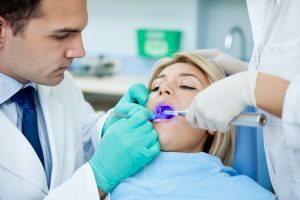 If you need a filling, we will begin by numbing the affected area with a local anesthetic. This will help with the pain and discomfort of removing the decay from the tooth and making a space for the filling. We will repair the cavity by using a composite material that matches the color of the tooth. Finally, we make sure the tooth is shaped properly and that your teeth still align properly when you bite. At Great American, we understand that you might be anxious about visiting the dentist and facing the possibility of needing a dental filling. We will do whatever we can to calm your fears, and make sure you’re as comfortable as possible during the filling procedure. Above all, we want your experience to be as pleasant as possible.